As with any new construction by the Arizona Department of Transportation, the Loop 202 South Mountain Freeway will have aesthetic details reflecting the area's history and environment. 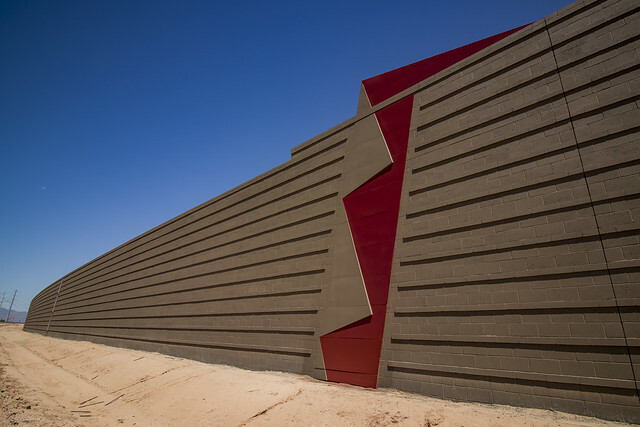 As we shared last week, our designers have worked with the Frank Lloyd Wright Foundation to honor the late modern architect with decorative fins and other details added recently to sound walls along the Pecos segment between 40th and 48th streets in Ahwatukee. This sawtoothed pattern, which also will appear on retaining walls, abutments and bridge barriers, is a nod to Wright's 1920s work at the Ocatillo Settlement in what became Ahwatukee. This winter encampment, where the architect worked on designs for a resort that never came to be, included triangular structures with horizontal bands that were Wright's artistic interpretation of South Mountain's peaks and valleys. The slideshow above includes more pictures of these newest features on the 22-mile freeway that will provide a direct connection between the West Valley and East Valley.